The Many Worlds Interpretation of quantum physics has been around for nearly 60 years. It’s a highly controversial idea which suggests that our world — and everything in it — is constantly splitting into alternative timelines. If it's correct, here's what your true existence might actually be like. Over a hundred years ago, the discovery of quantum physics ruined the party. Our comfortable, clockwork conception of universe was thrown into disarray with the realization that, at the micro-scale, there’s some crazy funky stuff going on. Thanks to quantum mechanics, we now know that matter takes on the properties of both particles and waves. What’s more, thanks to Werner Heisenberg and Erwin Schrödinger, we can never be certain about a particle’s momentum and position, nor can we be certain about an object’s state when it’s not being observed. In other words, the universe — at least at a certain scale — appears to be completely fuzzy and nebulous. Possibly even random. Quantum physics has royally messed up classical — and seemingly intuitive — principles of space and time, causality, and the conservation of energy. This means that Newtonian, and even Einsteinian, interpretations of the universe are insufficient. Indeed, if we’re to develop a unified and comprehensible theory of everything, we’re going to have to reconcile all of this somehow. But some physicists, upset by the implications of quantum mechanics on our ultimate understanding of the universe and our place within it, still choose to ignore or dismiss it as a kind of messy inconvenience. And it’s hard to blame them. Quantum physics doesn’t just upset conventional physics. It also perturbs our sense of our place in the universe; it’s Copernican in scale — a paradigm changer the carries deep metaphysical and existential baggage. Denial, however, won't help the situation — nor will it further science. Physicists have no choice but to posit theories that try to explain the things they see in the lab, no matter how strange. And in the world of quantum mechanics, this has given rise to a number of different interpretations, including the Copenhagen Interpretation, the Ensemble Interpretation, the de Broglie-Bohm theory, and many, many others. And of course, there’s the infamous Many Worlds Interpretation. Back in the 1950s, a Princeton undergraduate by the name of Hugh Everett III embroiled himself in the wonderful and wacky world of quantum physics. He became familiar with the ideas of Niels Bohr, Heisenberg, and Schrödinger, and studied under Robert Dickie and Eugene Wigner. Then, in 1955, he began to write his Ph.D. thesis under the tutelage of John Archibald Wheeler. In 1957, he published his paper under the name, "Quantum Mechanics by the Method of the Universal Wave Function.” Eventually, after further edits and trimming, it was re-published under the name, “Wave Mechanics Without Probability.” And though he referred to his theory as the “relative state formulation,” it was rebranded as the Many Worlds Interpretation (MWI) by Bryce Seligman in the 60s and 70s. But like so many seminal theories in science, Everett’s idea was scorned. So scorned, in fact, that he gave up physics and went to work as a defense analyst and consultant. Now, some 60 years later, his radical idea lives on among a small — but growing — subset of physicists. In a recent poll of quantum physicists, some 18% of respondents said they subscribe to the MWI (as compared to the 42% who buy into the dominant Copenhagen Interpretation). Essentially, Everett’s big idea was the suggestion that the entire universe is quantum mechanical in nature — and not just the spooky phenomenon found at the indeterministic microscopic scale. By bringing macroscale events into the picture, he upset the half-century’s worth of work that preceded him. The two different worlds, argued Everett, can and must be linked. No doubt, the problem that quantum mechanics presents is the realization that we appear to live in a deterministic world (i.e. a rational, comprehensible world) that contains some non-deterministic elements. Everett worked to reconcile the micro with the macro by making the case that no arbitrary division needs to be invoked to delineate the two realms. All isolated systems evolve according to the Schrodinger equation. Everett also argued that the measurement of a quantum object doesn’t force it into one comprehensible state or another. Instead, it causes the universe to split, or branch off, for each possible outcome of the measurement; the universe literally splits into distinct worlds to accommodate every single possible outcome. And interestingly, Everett’s idea allows for randomness to be removed from quantum theory, and by consequence, all of physics (thus making physicists very happy). It’s worth noting that the MWI stands in sharp contrast to the popular Copenhagen Interpretation, a branch of physics which says quantum mechanics cannot produce a coherent description of objective reality. Instead, we can only deal with probabilities of observing or measuring various aspects of energy quanta — entities that don’t conform to classical ideas of particles and waves. It’s proponents talk about the wavefunction collapse — which happens when a measurement is made, and which causes the set of probabilities to immediately and randomly assume only one of the possible values. According to Everett, a “world” is a complex, causally connected sub-system that doesn’t significantly interfere with other elements of the grander superposition. These “worlds” can be called “universes,” but "universe" tends to describe the whole kit-and-kaboodle. Needless to say, it's a metaphysical theory that dramatically alters our understanding of the universe and our place in it. If true, the universe is comprised of an ever-evolving series of timelines that branch off to accommodate all possibilities. Subsequently, it means that a version of you — or what you think is you — is constantly branching off into other alternate histories. For example, in the case of Schrödinger's cat, it’s not both alive and dead when not observed. Instead, a version of it ceases to exist, while another lives on in an alternative timeline. As another example, one version of you will stop reading my article at this exact point, while another version will continue to the very end. There may even be an evil version of you somewhere. So long as it’s probable — and that it doesn’t violate physical laws at the macro-scale — a new version of the universe, and all that’s within it — will be created. In turn, those will continue to branch off based on the new contingencies contained therein. But Everett-worlds in which probability breaks down can never be realized, and by consequence, never observed. So what appears to be a single individual living from moment to moment is actually a perpetually multiplying flow of experiences; there is not just one timeline. Instead, there are many, many worlds. This means that all possible alternative histories and futures are real. 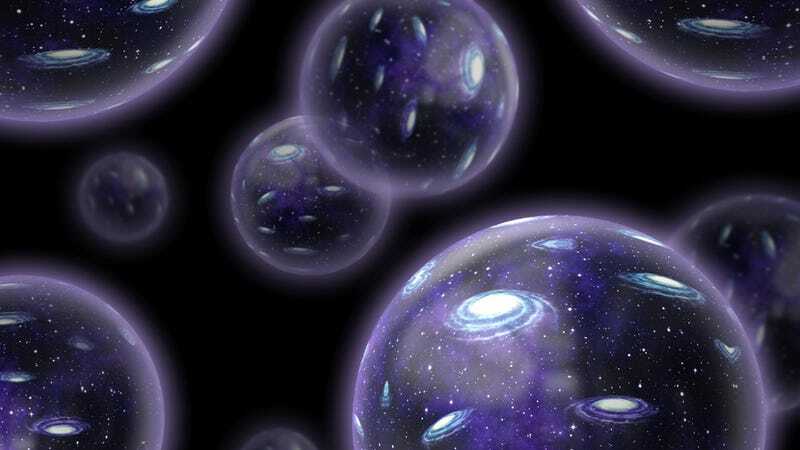 This also means that there could be an infinite number of universes — and that everything that could have possibly happened in our past has in fact happened in the past of some other worlds. Not surprisingly, there are a number of objections to the MWI. As noted, 82% of quantum physicists don’t buy it. One of the most common complaints is that MWI grossly violates conservation of energy (i.e. where the hell is all the energy coming from to fuel all these new universes?). Others argue that it violates Occam’s Razor, that it doesn't account for non-local events (like an alien making an observation far, far away), or that its parameters and definitions, like “measurement,” are far too liberal or vague. And of course, it leads to a host of strange conclusions. For example, a version of you will win the lottery every time you play it. Sure, it's highly improbable, but not impossible. In the space of all probable worlds, a version of you will have to experience it. Perhaps even more bizarre is the scenario in which a person — someone who cannot play a musical instrument — sits in front of a piano and plays Debussy's Claire de Lune to perfection strictly by chance. Sure, the odds of correctly hitting each successive note gets astronomical in scale as the piece progresses — but this is the weirdness that arises when we have to consider (1) probabilities and not impossibilities, and (2) the near-infinite number of expressions of all possible worlds. But something about this scenario just feels...wrong. [F]or now, the MWI is physically dependent. That is, the likelihood of an outcome is assessed from physical potential. However, we all know that the likelihood of events isn't contingent upon physical potentials. I know, for instance, given the evolution of my own life/mind, that the likelihood of me becoming a materialist tomorrow, is zero. I have no doubt about that, given that I've already been there and seen the flaws thereof (not to mention everything else I've 'seen'). Likewise, you all may be sure of some thing or other. Further, for example, though the physical potential exists, the likelihood of tomorrow's papers headlining The Pope as a murderous gay atheist, seems bleak, to say the least. Therefore, are these many worlds constrained by what is physically possible, or by what is sensibly possible? That is, do mental/emotive concerns dictate what worlds are possible, or simply physical potentials? On the face of it, it would seem that the MWI doesn't have any recourse towards mental potential/agency. Which is a great point. At what point does probability — even within the confines of classical physics — enter into the realm of sheer improbability? In the previous example, that of our insanely lucky piano player, such a thing might never play out because the person hasn't developed the proper finger musculature, or they may suddenly stop mid-performance, aghast at their freakish achievement. And there’s also the issue of testability. Regrettably, we can’t communicate with our splitting selves. Each version of us can only observe one instance of the universe at any given time. Subsequently, the MWI is considered untestable — leading many to dismiss it as being unscientific or just plain bonkers. Actually, there may be a way to test it. MWI implies the quantum immortality hypothesis — the argument that a version of us will always observe the universe — even in the most improbable of circumstances. To test the MWI, all one needs to do is attempt suicide based on a 50/50 probability schema. According to the theory, a version of you will survive 50 successive 50/50 suicide attempts — but it's a one in quadrillion chance. The trick, of course, is to live the life of that particular version of you. Good luck. Hugh Everett, despite his belief in quantum immortality, died in 1982. But his idea lives on — a kind of immortality unto itself. Images: Shutterstock/Juergen Faelchle, Shutterstock/Victor Habbick.